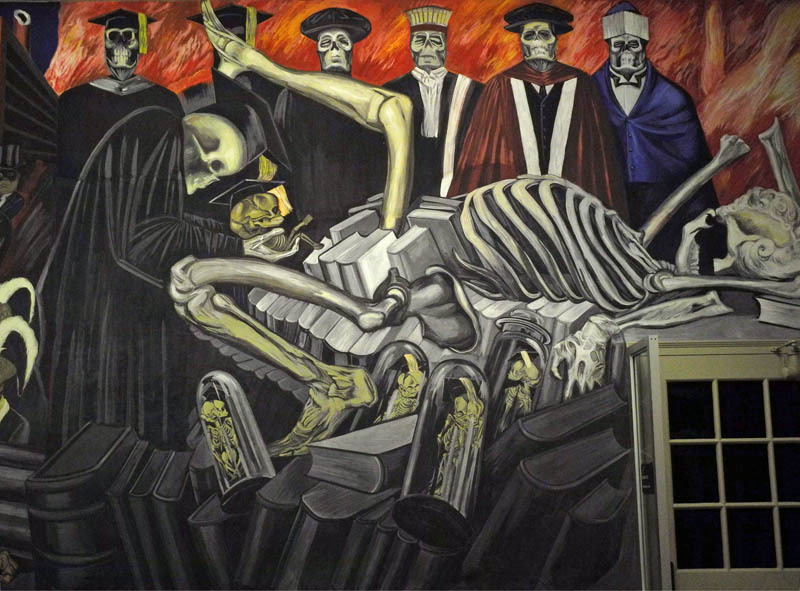 On the lower floor of the Dartmouth College library, in the reserve reading room, is a complex, dramatic, ambitious and disturbing fresco cycle by José Clemente Orozco, one Mexico's foremost 20th century painters. I first saw it about 15 years ago and was taken aback by its aggressive form and structure and its fierce imagery. At the time, the college seemed almost embarrassed by the murals: tables were drawn up close to the paintings; no one seemed to be paying them any attention. When I revisited them recently, this had changed; the paintings were roped off so you could see them clearly; a very informative brochure was produced in 2007 which you can download at this link; there were quite a few people visiting. 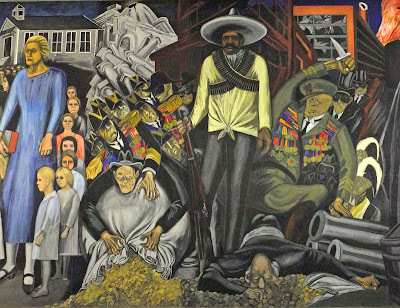 The monumentality of Orozco's achievement has been recognized. I have to admit straight away that I don't find this a likable work except for a few panels, but I do find it admirable. It is very much of its turbulent time, painted between 1932 and 1934. Orozco envisaged the mural as a history of the two American races, indigenous and European. 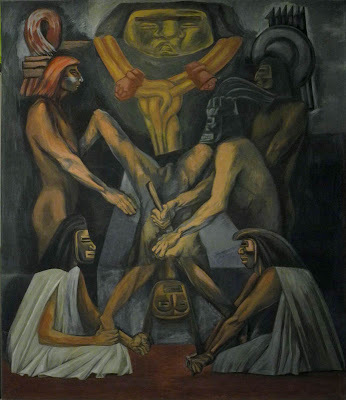 In the panel Human Sacrifice, above, he isn't meaning to condemn early Mesoamericans, as explained in the brochure, but to compare their notion of sacrifice with the modern one of humankind being crushed by machines and war, but during the Golden Age there was peace in farming and in art. 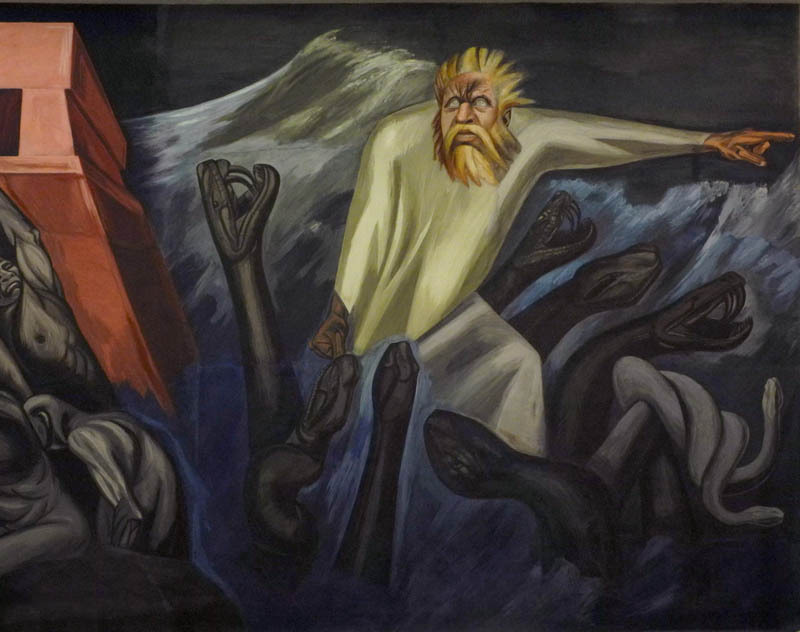 The great American myth of Quetzalcoatl is a living one embracing both elements and pointing clearly, by its prophetic nature, to the responsibility shared equally by the two Americas of creating here and authentic New World civilization. My favorite part of the mural cycle were the five panels on Modern Industrial Man. In these images there's a sense of a possible union of man and machine. 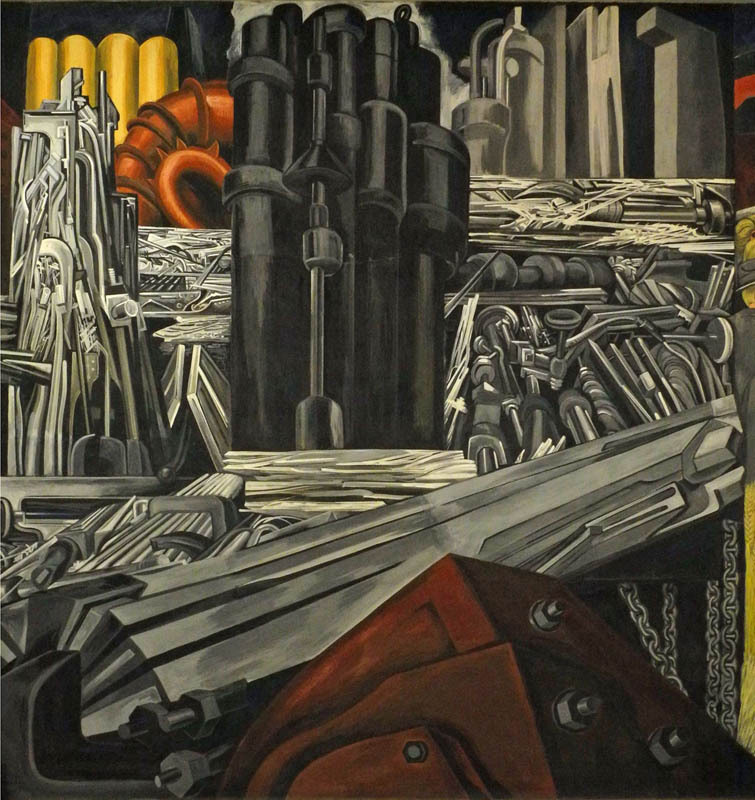 The long narrow panel above, high on the wall, shows a worker at leisure, reading to enrich himself while a powerfully imagined building under construction awaits. 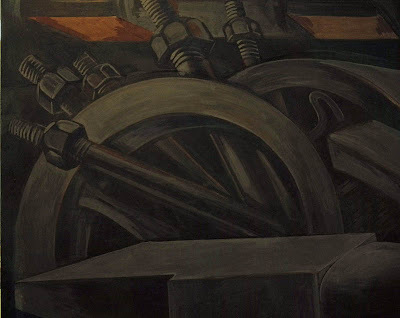 With my interest in machinery, how could I fail to be interested in these industrial images? There is a sense of strength of purpose in building a new world; although the workers seem overwhelmed by the materials of construction surrounding them, they are huddled together as a cooperating unit. 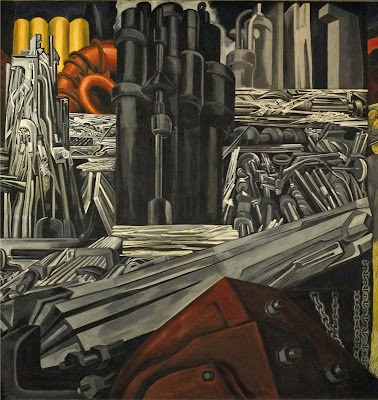 While there may be positive view of industry in the Modern Industrial Man panels, once we move to the adjoining room, the Machine has become a source of monstrous disarray. 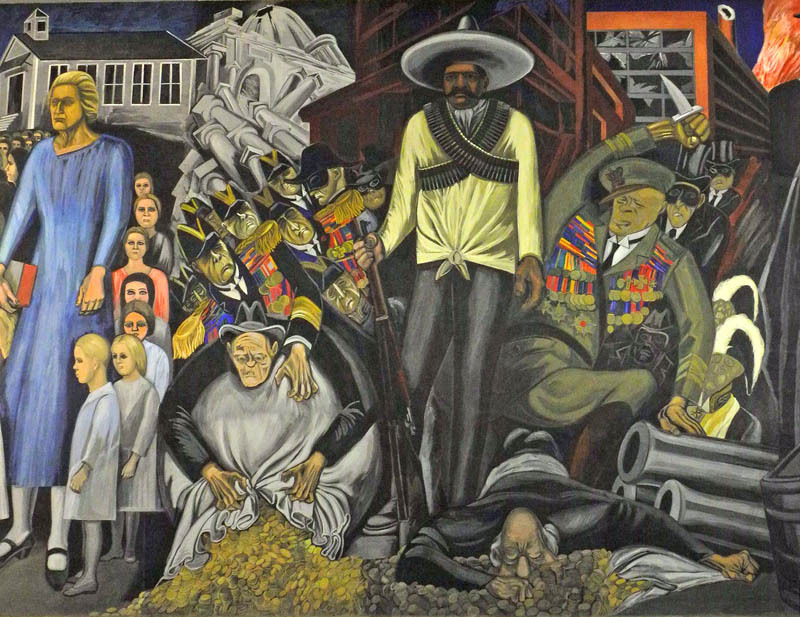 A Mexican revolutionary stands amidst the chaos of greed and war, alongside the Anglo image of quiet uniformity. 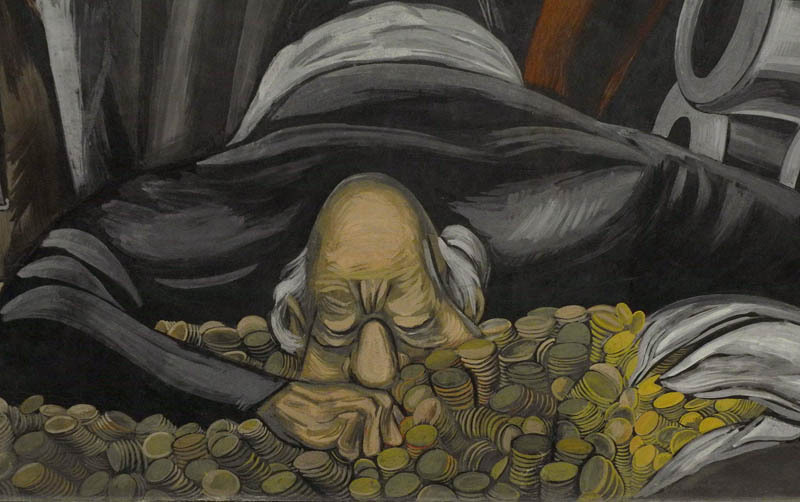 It seems that some things don't change, unfortunately, and an image of gluttony over gold can still be an emblem of our time, as can militarism. To me, this is the most vicious of Orozco's depictions. How was this received at Dartmouth, this chilling equating of academia and death? 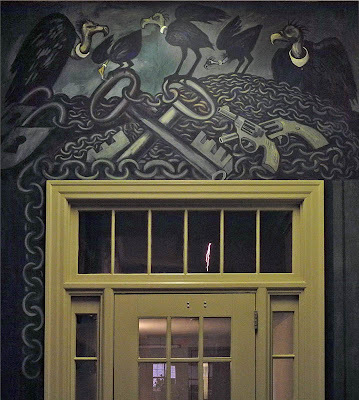 Above a doorway, a symbol of openness, are vultures watching over a mound of chains; two guns add to the foreboding atmosphere. 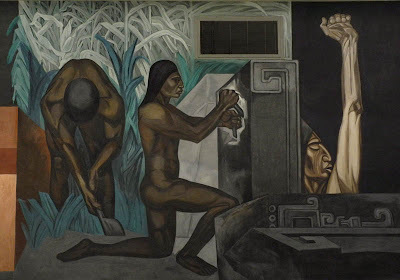 Orozco believed that the public form of mural art, which he practiced in the ancient technique of buon fresco, raised it above other forms of art; he wrote that "it cannot be hidden away for the benefit of the privileged few". 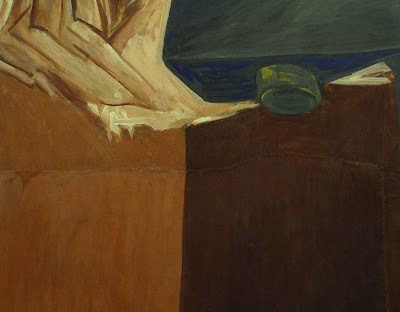 One of the great treats for me in seeing this emotionally difficult mural cycle was getting a close view of the free brushstrokes, and seeing the boundaries of each day's work as evidenced by raised lines moving across the surface. Because the paint was applied on wet plaster, only a small section could be completed in a day. In the detail above, you can see a horizontal line and a vertical on the right that indicate where one day's work met another. 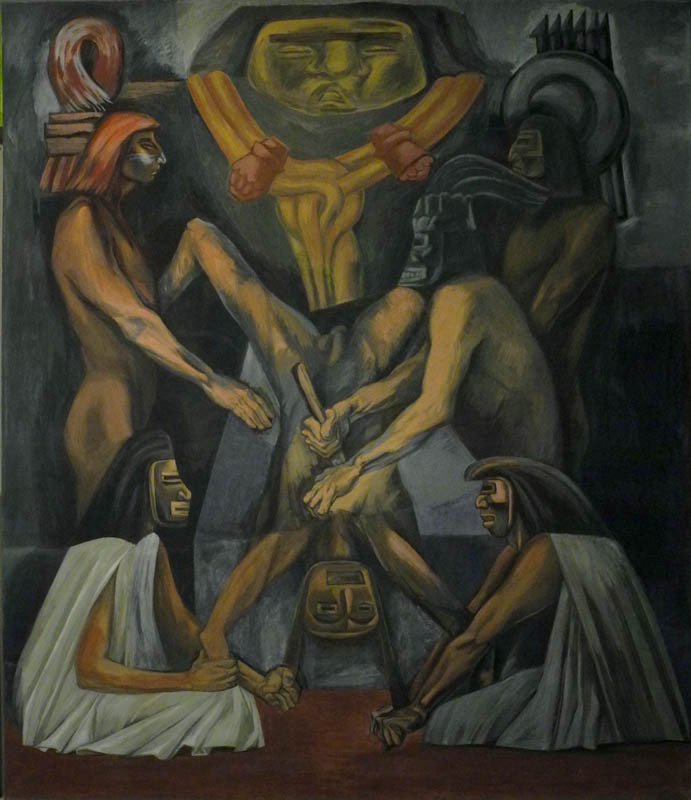 This was quite an undertaking, a modern day equivalent to the frescoes of the Italian Renaissance, where the dark history of the Americas replaced religious narratives. That's so interesting, Jan, that you have a memory of visiting this with your father. 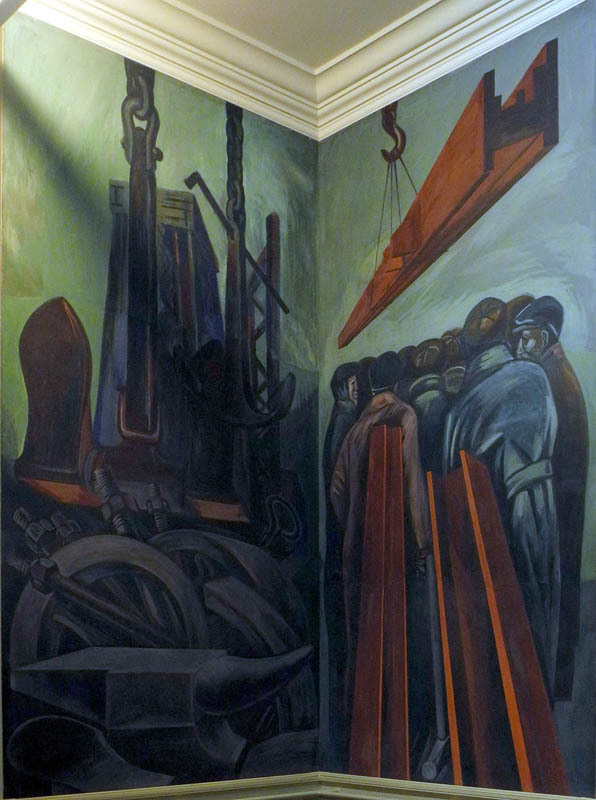 When Jackson Pollock was a young man in the late 1930s he also traveled up to Dartmouth to see the murals. Thanks for this informative post. These new to me. So interesting that a place like Dartmouth would have these! I stayed at Orozco's home and studio in Mexico City in '89. Who knows what it was like when he lived there, but in the 80s it was quite calm and ordered. I can't recall, but it may have been run by Quakers...But fascinating sense of history. I'm glad to have introduced these paintings to you, Julie. 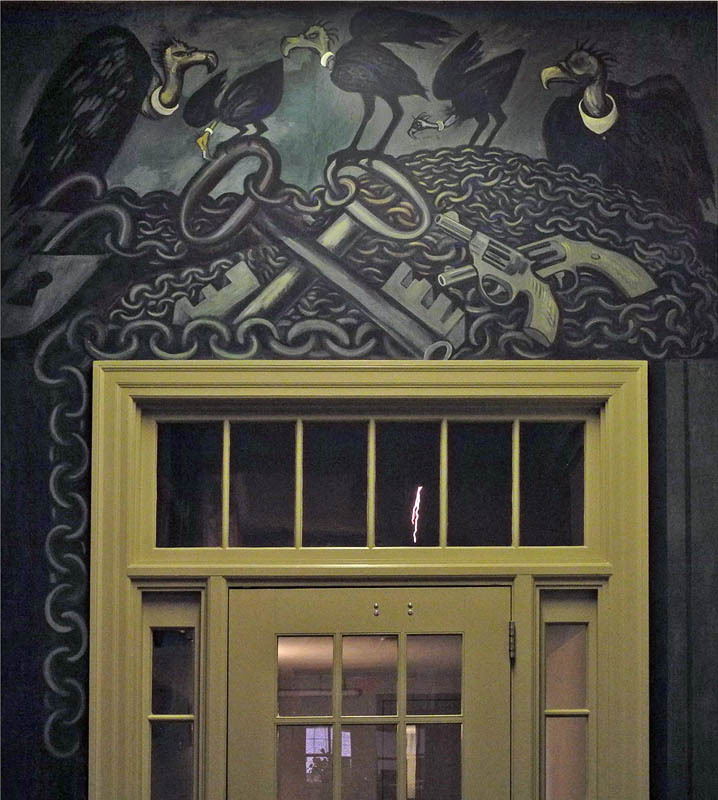 A couple of art history professors had the idea of bringing a muralist to Dartmouth. You can read story of the commission in the brochure, link above. A New Painting: "Yellow Triangles"